Cahir Bridewell in 1853-earliest view. A defensible fortified structure was on this hilltop from at least the sixteenth century. The Pacata Hibernica depiction of the siege of Cahir Castle (1599) shows such a building. In 1690, during the Williamite campaign, earthen and stone outworks were erected around it, presenting an ideally defensible fortification for the Danish troops of William II who, during that winter, had quarters in Cahir and nearby Clonmel. Materials from this earlier structure were incorporated in the present building, while the associated outworks were adapted to serve as the castellated wall encircling the grounds. In 1809, at the Summer Assize Presentments of the County Tipperary Grand Jury, funding was laid aside for the future provision of a bridewell in the town of Cahir. Bridewells (small town gaols) were generally small two-storey buildings, built of cut-limestone, and costing up to £800 to erect. They held prisoners temporarily, pending space in the county gaol, and were funded by the grand jury system (predecessors of the county councils), but supplementary central resources were also available, in certain circumstances. At Cahir, a committee led by local landlord, Richard Butler, baron of Caher – soon to become first earl of Glengall – was successful in attracting over twice the usual funding. Their chosen architect – Michael Bernard Mullins – submitted two plans, both variants of the same elaborate, castellated structure, costing some £2,000 to build, which would emphasize the fortress origins of the site and overawe the local population. This involved the creation of towers, turrets, battlements and a machicolation (defence mechanism over the main door, through which boiling oil was thrown on attackers of medieval castles) of hand cut limestone, an expensive and time consuming process. Construction of the Cahir Bridewell commenced in 1813, and it was opened for the admission of prisoners in 1816. The original section is three stories in height, with a cut-limestone spiral staircase in the main tower. It originally comprised five cells, two dayrooms, two keeper’s rooms and two exercise yards, the latter incorporating obtuse and acute angles suggestive of late medieval starfort design. The inner grounds – comprising ½ acre – are encircled by a castellated wall and gateway arch, beyond which lies 5½ acres known as The Bridewell Field. The bridewell was enlarged in 1849-50 – at the height of the Great Famine – when the prison compliment was increased to eight cells (four for males, three for females and one for drunken / violent prisoners), two dayrooms, two storerooms, and two exercise yards. An inter-connecting keeper’s residence was also erected – comprising a kitchen, dining room, sitting room, and two bedrooms. 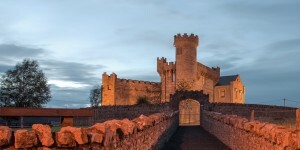 Cahir Bridewell received mention in several noteworthy publications due to its unique appearance and situation. Perhaps the earliest coverage, however, was in May 1827 when the local Clonmel Gazette newspaper carried the headline ‘two men escaped from Cahir Bridewell’. The men managed to escape unnoticed but were recaptured the following day. Following on from this incident, the parapet of the exercise yards was raised! In 1837 The Lewis Topographical Dictionary of Ireland stated ‘the bridewell is a handsome castellated building, containing five cells, one dayroom and two airing yards. However, the Inspector General of Prisons (Ireland) Reports of the 1830s and 1840s noted a great decline in the condition of the building, notice of which reached a more general readership in The Parliamentary Gazetteer of Ireland (1846), which stated ‘The Gaol is distinct and suitable in architecture. A short time ago, it was remarkable for its dilapidated state and bad management, but in 1841 it underwent repair.’ The keeper was ‘a painter, who occupied the house for his trade’, and was ‘totally unsuitable to his office’. Following this damning report, the superintendence of all bridewells of the south riding of Tipperary was placed under the governor of HM Richmond Prison, Clonmel – which was appropriate, given that these temporary places of confinement acted as reserve accommodation for that gaol. Thereafter, a system of training keepers and turnkeys at Clonmel gaol was utilised to great effect. Also, their salaries were increased from £5 in the 1810s (from which minor repairs were paid, leaving little incentive for upkeep) to £30 by the early 1840s, gradually increased to £50 by 1876. Due to the lawlessness and poverty of the period, large numbers were confined at Cahir Bridewell over the years. In the year September 1825 to September 1826, 156 prisoners were confined here for an average of three days (awaiting transfer to Clonmel Gaol), at an average cost of 5d. per head. Numbers confined continued to increase, peaking during the famine years when, during one quarter of 1851, 533 prisoners were confined. The prisoners were fed a pound of bread and a pint of new milk for breakfast, and a pound of bread and a pint of skimmed milk for dinner. The local Anglican clergyman was the inspector. Each cell contained, per person, one iron bedstead, one bed ticken and three blankets. This earliest view – an engraving from 1853 – was commissioned when the property was featured as a notable building in the auction catalogue of Cahir Estates. The Encumbered Estates Court sold the majority of the estate, as it had been bankrupted through town improvements and a lack of tenant rents during the Great Famine (1846-51). Cahir Bridewell was one of 52 gaols closed by the prison authorities in 1878, as part of an island wide rationalization. The estate then leased the keepers’ residence to local military officers until the purchase of the building from Lt. Col. Richard Butler-Charteris by David Butler (1890-1955), in 1919. He continued the estate tradition of leasing the keeper’s residence, for a time, before residing here in retirement. Following the marriage in 1969 of his son, John (Séan) with Margaret (Peig), the couple commenced renovating the remainder of the building, which opened in May 1976, as a guest accommodation. © 2019 Carrigeen Castle, Cahir, Ireland. All Rights Reserved.